Have you ever visited the set of a movie destined to become a classic? Or perhaps visited the set of a series of classic films YEARS after they hit the big screen? Were any of these experiences in New Zealand and not the San Fernando Valley? 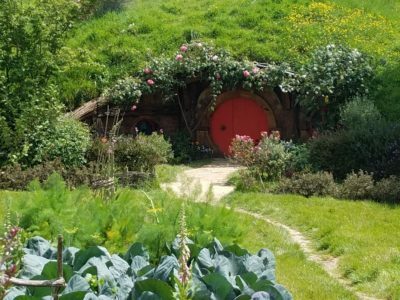 We enjoyed such an adventure on Tuesday, October 23 to “Hobbiton,” the preserved movie set Director Peter Jackson designed and constructed as the “Hobbit Shire” in his famous adaptations of J.R.R. Tolkien classics. Based outside of Matamata on a real, working sheep and beef farm, the tour was a feast for the eyes and not a destination one is soon to forget. Being where I had witnessed such distinct scenes across 6 films was surreal. 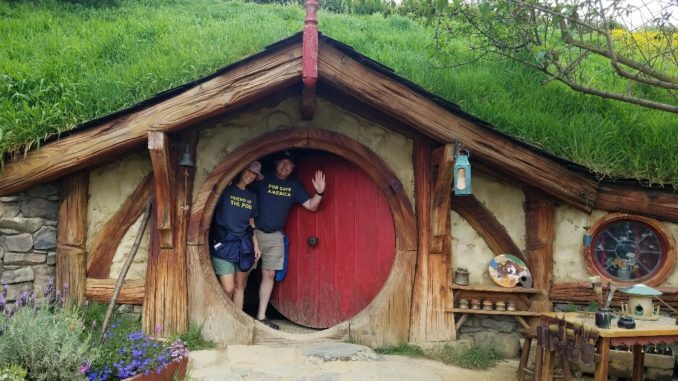 This submission will be dedicated to my and Erin’s trip to Hobbiton, and our subsequent day trip to New Zealand’s East Coast following the tour. We left Auckland about 8:30 AM, having risen early to ensure we would best the 2.5 hours to the Hobbiton set in time for our 12:30 guided tour. Checking the day’s weather ahead of one’s activities is very entertaining in New Zealand. Most newspapers use the term “Fine… except for some winds.” Or, “Fine…but with clouds in the afternoon” to describe the day. What the Hell is “Fine? !” I’m a neurotic. You need to give me a specific temperature and tell me the degree of wind and/or rain activity. “Fine? ?” Please…. And Erin, knowing how much this bothered me, even got me to laugh a little bit. At least the vague weather report made us feel we weren’t in Los Angeles anymore, and we’re actually from a city where “fine” could probably be used most days of the year! We arrived at Hertz car rental where an incredible woman named Cathy served us. Cathy, who was either a Maori native or a Pacific Islander who has lived in New Zealand a good portion of her life, provided us a free upgrade to a hatchback that actually had room for our massive bags of luggage. She was fantastic, taking a half hour and seemingly in no hurry to scurry us off without the right fit. Our car? A white Ford Focus we quickly nicknamed “Focus the White” in honor of Lord of the Ring’s “Gandalf the White” (When in Rome … [or Hobbiton] … do as the Hobbits and Wizards do). “Focus the White” didn’t let us down. It was actually a blast sharing driving duties with Erin, and for my first time, learning how to drive on the opposite side of the road. What a rush, at first, but after a while, a new habit that quickly felt natural. After all, after about 15 minutes one should be able to adjust, recognizing it’s just everything backwards. On our 2.5-hour drive from Auckland, we passed through suburban exurbs and plenty of farmland. One thing that struck me was how many cows we saw on the side of the road vs. sheep. Where were the massive numbers of sheep I was promised in New Zealand? Was the statistic that there are 3 to 4 times the number of sheep in N.Z. as there are people just a myth or a “fake news” rumor? There was a marked increase in sheep sightings off the highway as we got further from Auckland, but by far more cows. We also caught glimpses of several beautiful horses, tiny ponies, and even an alpaca or two. Being an American, I naturally assumed that a big build-up of anticipation would meet us along the journey in the form of noticeable highways signage. “Only 40 more Kilometers to Hobbiton!” and the like. NOTHING. We were guided on so many cut through double lane mini-highways in the final hour, we really wondered if we had plugged in the address correctly to Ford navigation. FINALLY, with only – I’m not kidding – 3 km to go, we finally see a casual sign saying something to the effect of, “Hobbiton… 3 km on your left.” Oh, thanks. We weren’t halfway to a coronary or anything! My new warning label for New Zealand: “NOT for neurotics with anxiety who need answers sooner.” But of course, despite these Todd-testing little omissions of information from the weather or directions, I am having a blast. As we park and make our way to the Hobbiton (most would be “towns” are simply spelled and pronounced “ton” in N.Z.) lobby, we’re quickly greeted by what we later realized was an all-female staff of ticket hosts. Friendly as could be, the women adjusted to our early arrival by putting us on an earlier tour. Still with 40 minutes to spare, we made our way to the “Hobbit’s Rest” restaurant where we were once again served by an all-female team of Tolkieners. Erin dove into some pumpkin soup. I enjoyed a lamb burger that was absolutely perfect. Once on the shuttle and headed for the nearby Shire, our tour guide, Alex, warmed us up with some trivia and stories about the film shoot. She played a video welcome from Sir Peter Jackson, creator and director of the Rings and Hobbit films, as well as from a man named Russell Alexander. Who is Russell Alexander, you wonder? He’s the man who allowed Peter Jackson and his production team to transform dozens of acres of his farmland to create The Shire. As the story goes, the elder Alexander at first shut the door in Mr. Jackson’s face after Mr. Jackson’s initial location shoot. 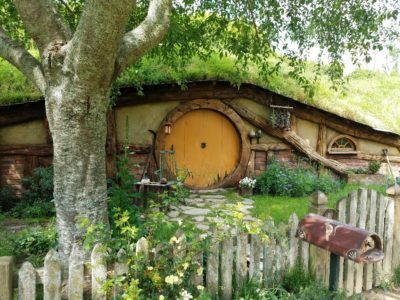 But Russell, his son, made chase and said, “hold on a minute… this sounds pretty cool.” What has resulted is a brilliant, and I’m sure quite profitable, partnership between Peter Jackson’s studio and the Alexander family to keep The Shire alive as one of several “Hobbiton” tourist destinations. Others are scattered in other parts of New Zealand where most of the exteriors of the films were shot. Alex, a Canadian on a two-year work visa in New Zealand, was a brilliant guide, telling stories of the shire while also allowing the 35 or so of us in her tour group plenty of time to take photos and family poses in front of Hobbit dwellings. As you’ll see from my photos, most Hobbit Holes are closed door. Only one is left open for photo ops. The main reason for this is that the INTERIORS of the Hobbit residences were all filmed on studio lots. The Hobbit addresses you see build into the countryside are merely very effective facades. 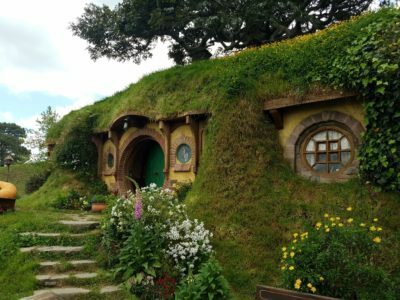 Also – not every Hobbit residence is built equal. Because the films required a lot of forced perspective to deal with the actor’s real heights, both compared to Hobbits as well as to the tall wizard Gandalf, several of the doors are quite large, while others are only a fraction of the size. All are still charming, but a brilliant way to create these effects in a world in 1999 and 2000 where CGI was not as mature as it is today. Other tales? 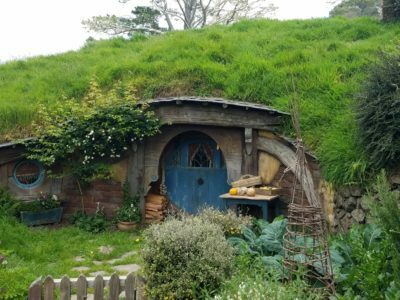 Alex share with us that in the re-engineering of the land to allow for the construction of the Hobbit residences, the New Zealand government fell short of the money it had promised to incentivize domestic production. Their solution? They localized the New Zealand Army to work the land and ready it for construction. Their reward? Most soldiers accepted small parts in the Lord of the Rings films… as evil Orcs! Alex claims that at one point, Peter Jackson had to admonish the made up and costumed soldiers for turning the tide of too many battles the Orcs were supposed to be losing, which extended multiple takes and production time. I guess the New Zealand army has some battle chops. Who knew? Another involves actor Sean Astin, who plays Samwise Gamgee, Frodo’s most loyal and battle tested friend. In “Return of the King,” the final film of the Lord of the Rings trilogy, one of the final scenes shows a road weary Sam returning home to his wife and two young children. Astin, as an actor, hadn’t seen his real life family for 5 months as production dragged on. So, director Peter Jackson cast his eldest (but very young) little daughter to play Sam’s daughter. As he nears his gate, it became Astin’s daughter as Sam’s who runs from the house to greet him. The surprise proved so effective that Jackson kept the first take of Astin’s genuinely warm and enthusiastic response to being greeted by his own daughter dressed as a Hobbit. 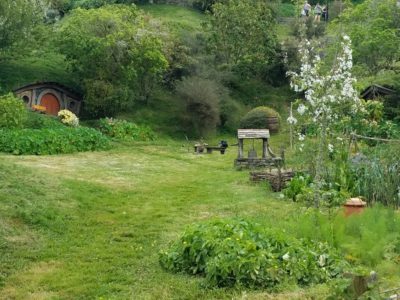 Hobbiton … you did not disappoint!